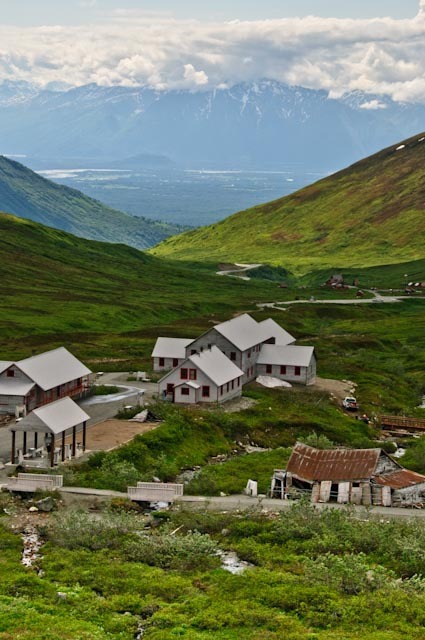 This photo taken in June 2009, while driving to Hatcher Pass, north of Anchorage. These are the remains of the historic Independence Mine—an old gold mine last operated in the 1940’s. A wonderful place to explore and learn about old gold mining operations, and of course to exercise your camera eye. In the far background you can see toward Anchorage. Right after I took this photo, it began to sleet and snow. The weather changes quickly in Alaska.